Observation - Meet the Pochards - UK and Ireland. Description: They may look like a happy couple however there were six drakes and only one female on the lake so who knows? 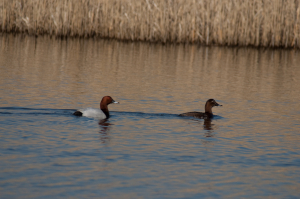 They may look like a happy couple however there were six drakes and only one female on the lake so who knows?